In many application fields, ranging from astrophysics and geophysics to neuroscience, computer vision, and computer graphics, data to be analyzed are defined as functions on the sphere. In all these situations, there are compelling reasons to design dedicated data analysis tools that are adapted to spherical geometry, for one cannot simply project the data in Euclidean geometry without having to deal with severe distortions. The wavelet transform has become a ubiquitous tool in signal processing mostly for its ability to exploit the multiscale nature of many data sets, and it is thus quite natural to generalize it to signals on the sphere. This generalization is not trivial, for the main ingredient of wavelet theory, dilation, is not well defined on the sphere. Moreover, when turning to algorithms, one faces the problem that sampling data on the sphere is not an easy task either. 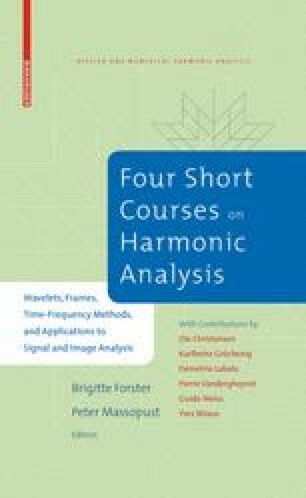 In this chapter, we discuss recently developed results for the analysis and reconstruction of signals on the sphere with wavelets, on the basis of theory, implementation, and applications.